but the longing for France dances in your mind daily? but you can't go due to work, or family illnesses, or not in the budget. What to do when you can't go to France? bring a little France to you. 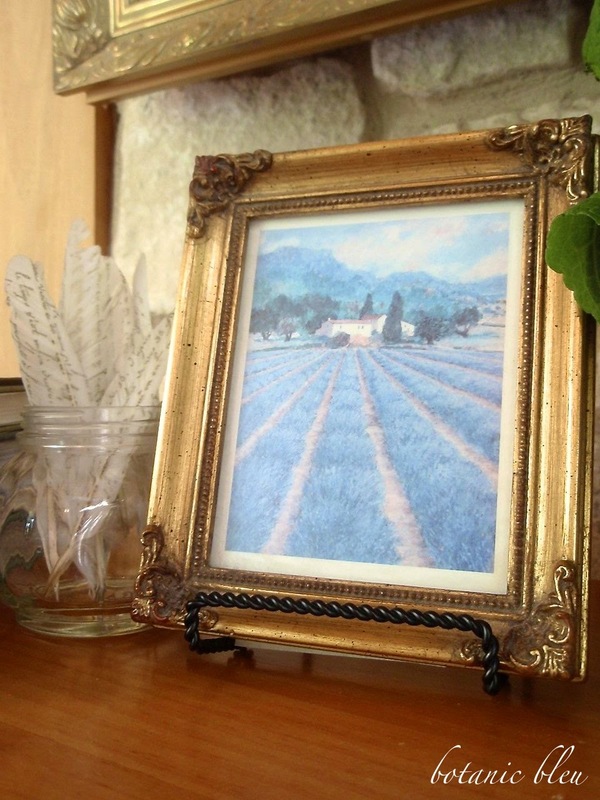 bring a little France into a favorite spot in your house. in full view from the kitchen and living room. 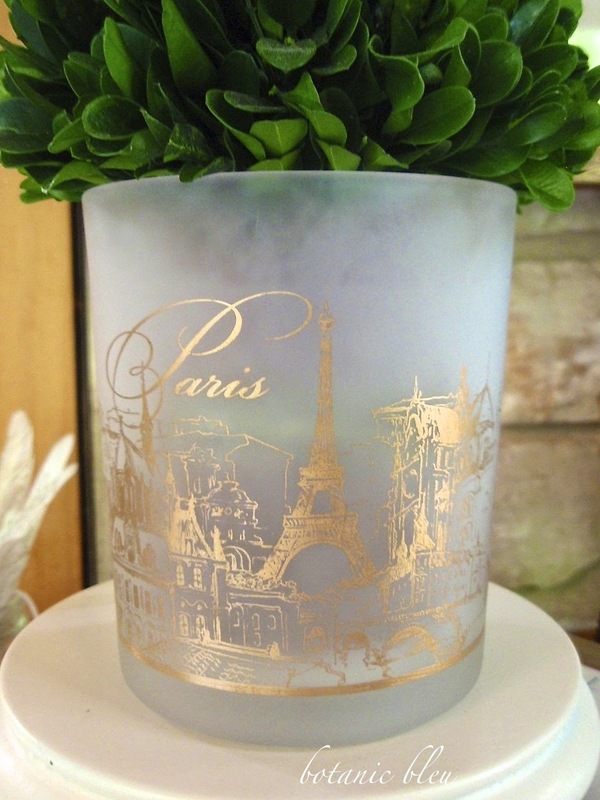 French country gardens and Parisian flower markets. The color bleu helps unify the grouping. that has golden scenes from Paris. Just seeing the books brings to mind France's beauty. through them to take a 30-minute tour while having coffee. looking through photos and reading about French scenery. 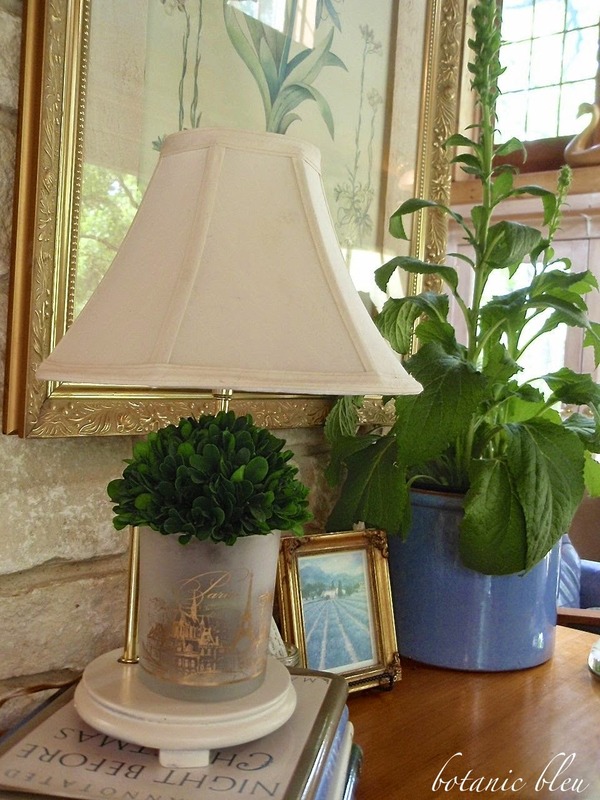 Place the boxwood at the base of a small lamp atop the stack of books. Design tip: Once again color has been repeated. This time, gold. and gold picture frame in the background. Sometimes good things come from accidents. Or perhaps, realizing not all is lost when accidents happen. 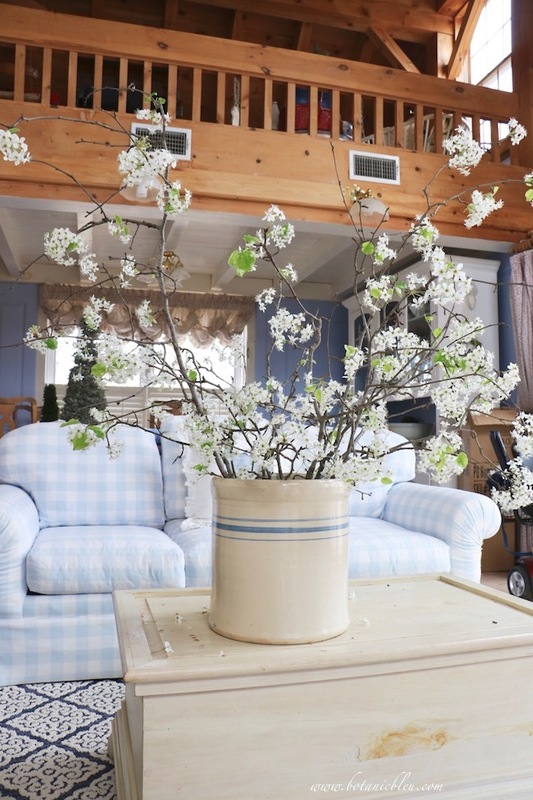 with a blue and white teacup filled with artificial pastel flowers. and breaking the handle of the teacup. Miraculously, the teacup was still intact. with a dear friend, now deceased, are tied to the little lamp. Both my friend and I bought this same lamp on one of those trips. the handle was glued together, but the teacup was not glued back to the lamp base. Painting the lamp base white gave it new life and an update. have retained the blue and white teacup. Now the lamp can hold any number of small things on its base. At Christmas time there was a small white vase with the word Noel. with each new grouping on the chest of drawers. purchased in France while touring lavender fields in Provence. bring vivid memories filled with details of authentic French life. relive a favorite memory of a previous trip. and the photos often are from a viewpoint not available to travelers. 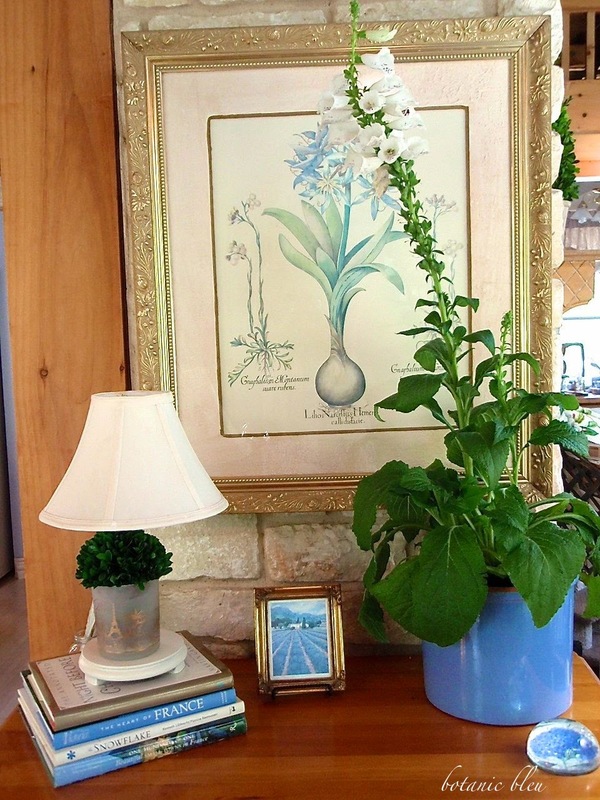 Design tips: The small picture's frame echoes the gold of the larger print's frame. The beading and corner accents in the wooden frame reflect French design. (or insert country of choice) to yourself? at the bottom of the page near the Comments section. makes it easy to find for re-reading in the future. Good morning, Judith. Love your ideas today! 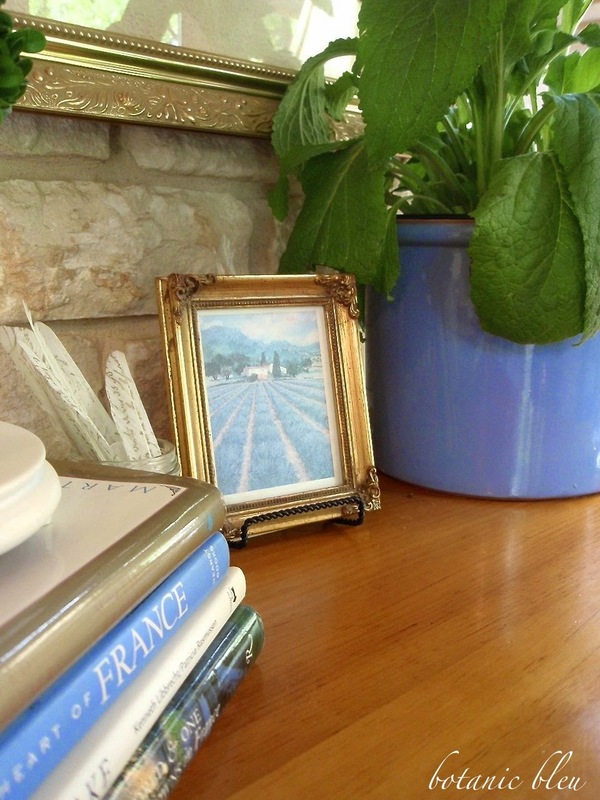 I've been tucking little French touches in here and there in our cottage. Baskets and vintage finds along with lavender are my favorites. Hope you have a lovely one. We are getting more snow! 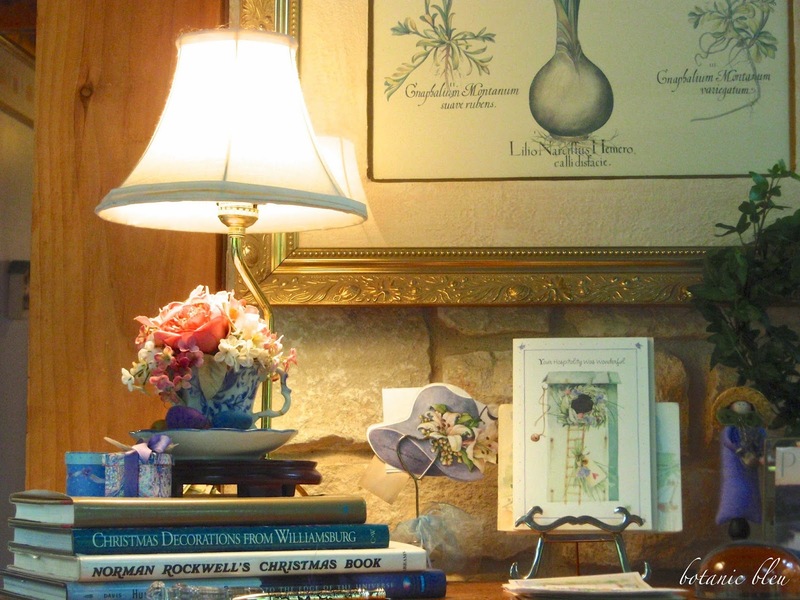 Tres charmant as always- what a lovely vignette- love that classic french blue color and the little details- I also love incorporating lovely french themed books in my decor. I love all of your pops of blue! SO pretty! I enjoyed all your tips and pretty photos. I also enjoyed the lamp and teacup story. Precious memory of a friend, thank you for sharing. I too tuck French items and meanings throughout our home. 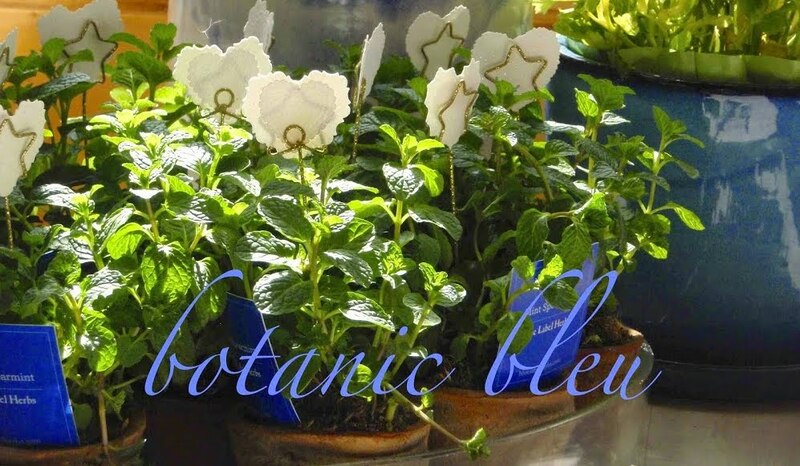 You had me at the blue French pot. I have The Heart of France on display in our guest room right now - great minds think alike! Judith, how beautiful! I love the touches all through your house!! I'm hoping to start transitioning to a French country style before too long! Have a wonderful day! Hugs! Reminds me of the scene in Its A Wonderful Life where she hangs up posters over the windows and decorates the inside Hawaiian to replace the experience of not going on their travel honeymoon. Wonderful spirit! 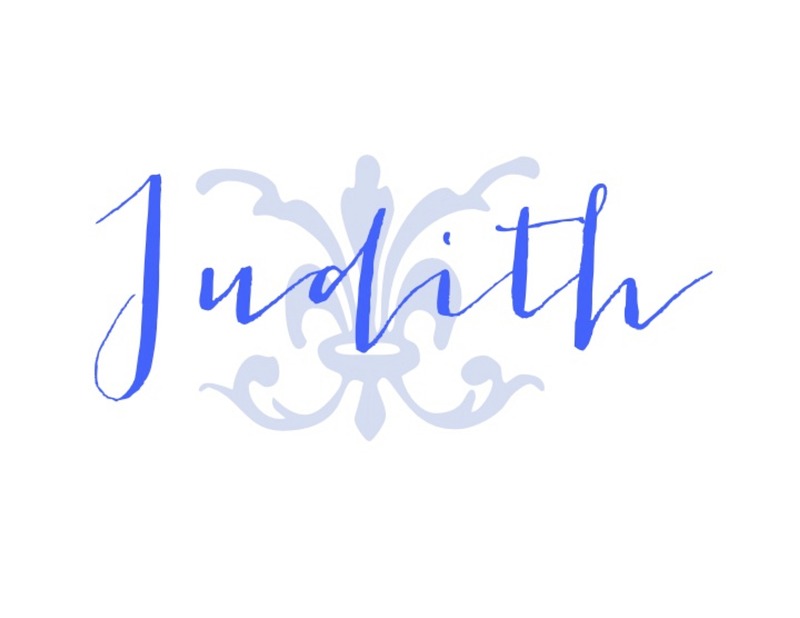 Hi Judith, thank you for a presious post, and all its Frenchness with a perfect French accent. Well you know I tuch more then a little French here and there in my home.... I try to surround myself with enough of it one way or another. 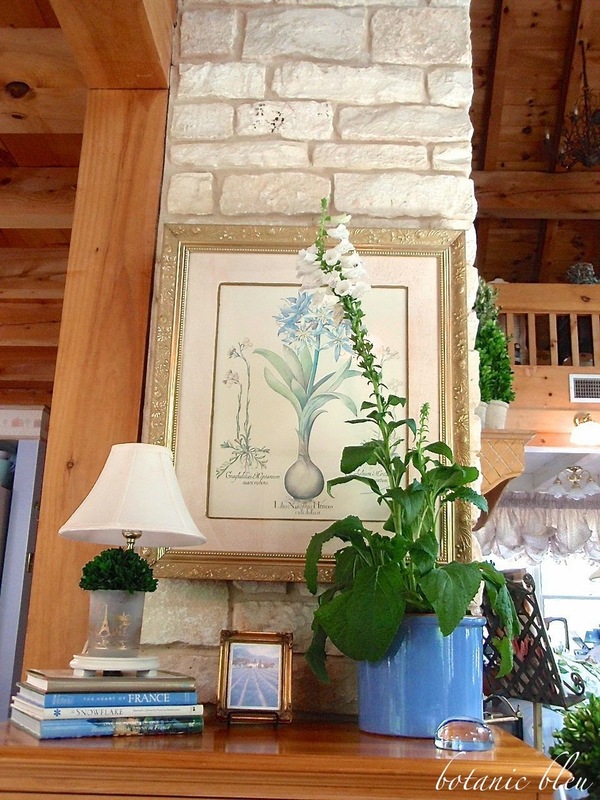 Your chest is divine as is the stone wall, all your vignettes of tucked pieces add all the rightness to your beautiful cottage. Ah, a subject very close to my heart, since my surroundings are very important to me and my mood! 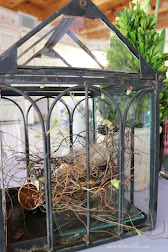 OK, the way I bring France into my home is with choice vintage pieces. I change out those pieces according to the season. Natural elements such as aged wood, stone, fresh flowers and white dinnerware on the aged pine table really add a desirable effect to the décor. 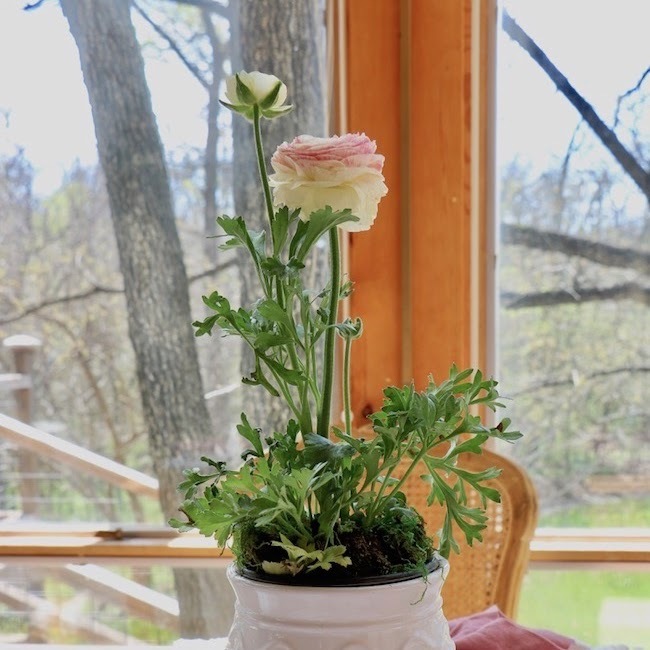 In the winter, I've used shed, bleached deer antlers and of course now for spring, it's fresh flowers. 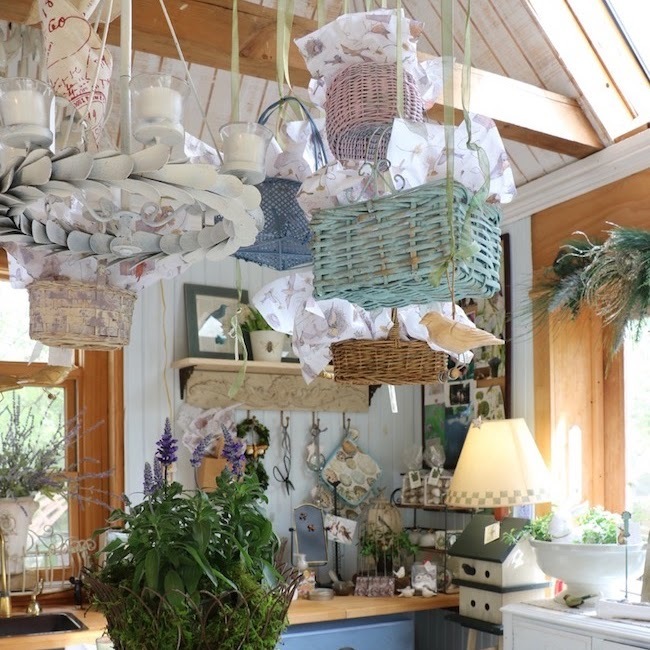 The French countryside mood to me simply involves natural elements and I like an open space with a combination of elegant elements (some crystal chandeliers!) living with more humble pieces such as a worn table with bleached sea shells...OH THE LIST GOES ON! 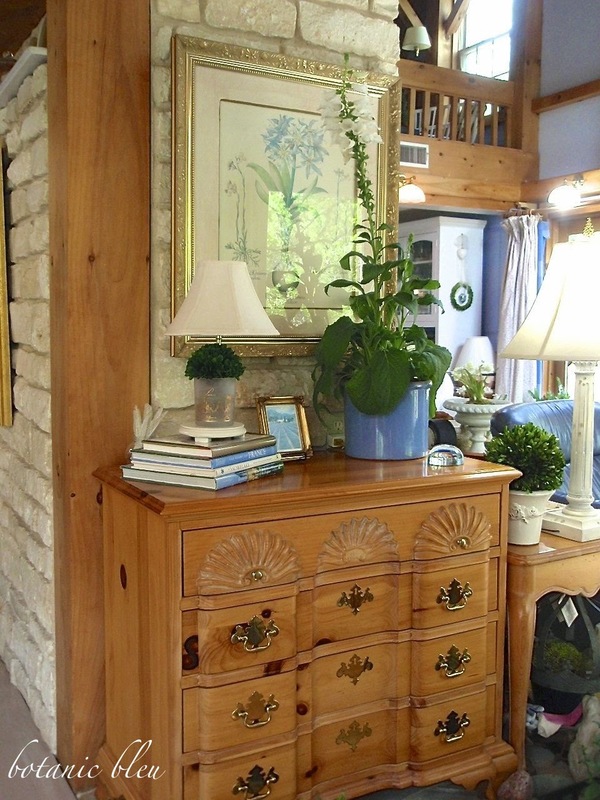 Love, love, love this chest and vignette. Beautiful. 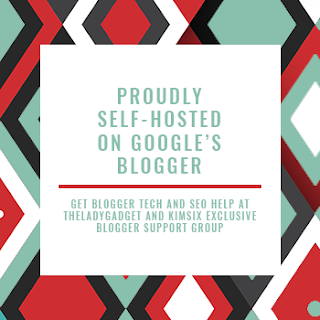 Thanks so much for linking to Inspire Me. 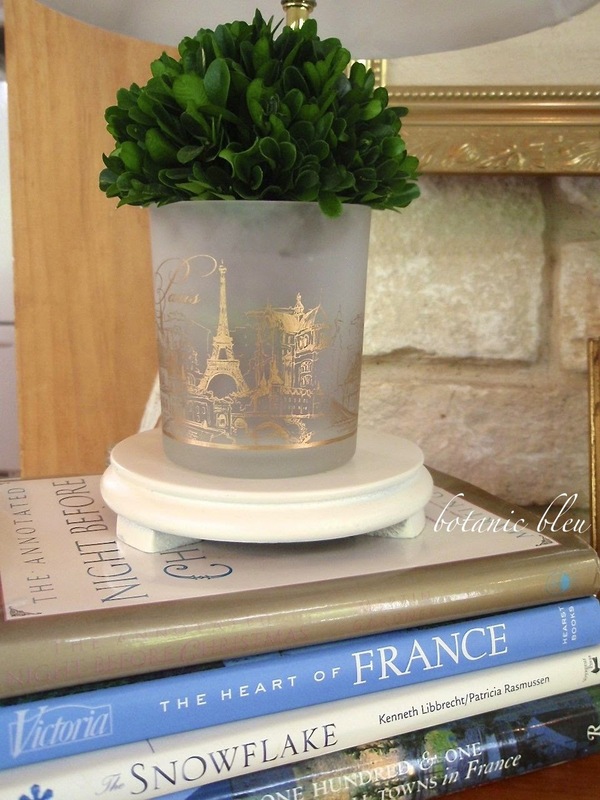 I love all your little touches of France in your home. Thank you for the four and tips! 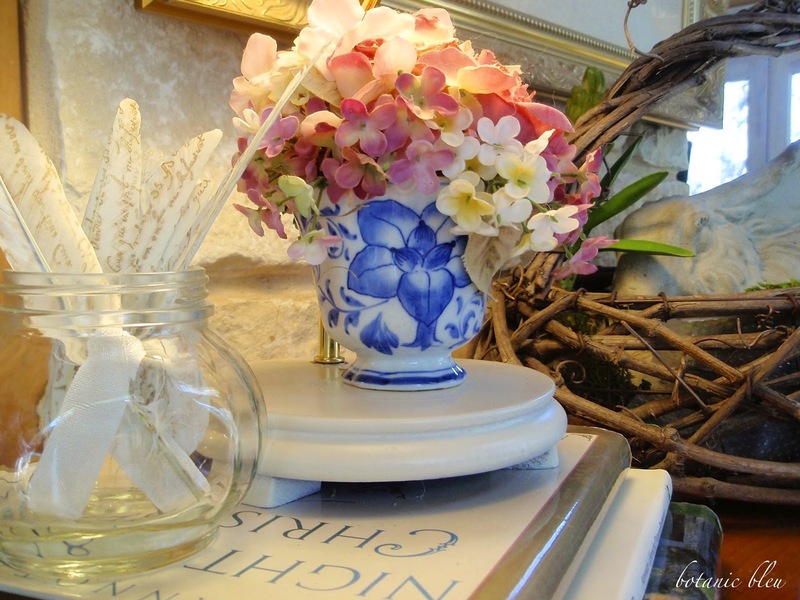 Very lovely tips for bring France into our homes! 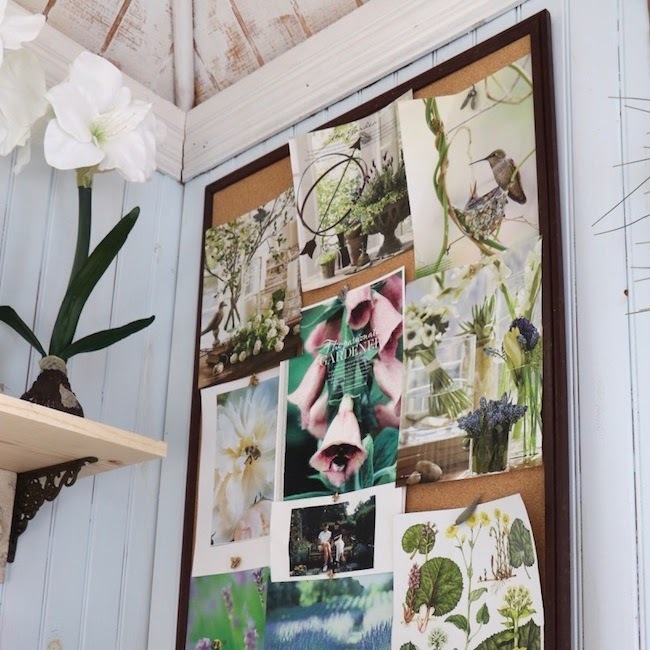 Love the bleu and the botanical print. The story of the lamp is priceless. Sometimes accidents do help us create something new from the broken pieces! Have a wonderful, creative day!